A few months ago I had never heard of Cluj-Napoca. If you’ve read my 5 Reasons to Make Eastern Europe Your Next Holiday Destination post, you’ll have seen that my holiday planning usually consists of using Skyscanner’s ‘Search Everywhere’ function and seeing where I fancy. This is exactly how I discovered this beautiful gem of a city. Cluj-Napoca (or Cluj) is situated in the Transylvanian region of Romania, and it has everything you would want from a European city break. I visited in September and weather was gorgeous for the 5 days (a sunny mid twenties) I was there, so this trip consisted of wandering around in the sunshine and drinking plenty of cold wine on sunny cobbled streets. If you’re visiting Cluj or looking for inspiration for your next city break, read on for my must-do guide! Let’s start with the most important part of any holiday: the food. There is a huge Italian influence in Cluj due to brief Roman occupancy, so you’ll find plenty of pizza, pasta and gelato. It’s tastes just as good as it does in Rome, but it’s significantly cheaper. The best Italian we ate at was called Da Pino, which was just off the central square and perfect for people watching! An antipasti board to share, a mouthwatering prawn linguine main and a bottle of crisp white wine in the sunshine = major holiday vibes. If you’re looking for some traditional Romanian cuisine, I would definitely recommend Roata. They have a beautifully shady garden where you will be welcomed with a local plum brandy (something I will not be trying again, but you’ve got to give these things a go!) and menu full of traditional dishes. I went chose a dish of polenta, cheese, pork crackling and sour cream. 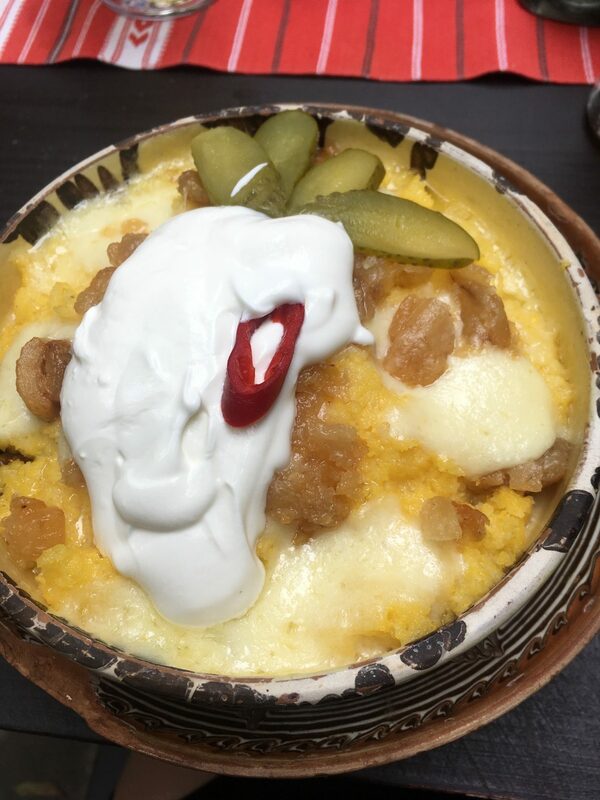 It wasn’t to my taste, but the restaurant is proud of this dish so I’m glad I tried it. 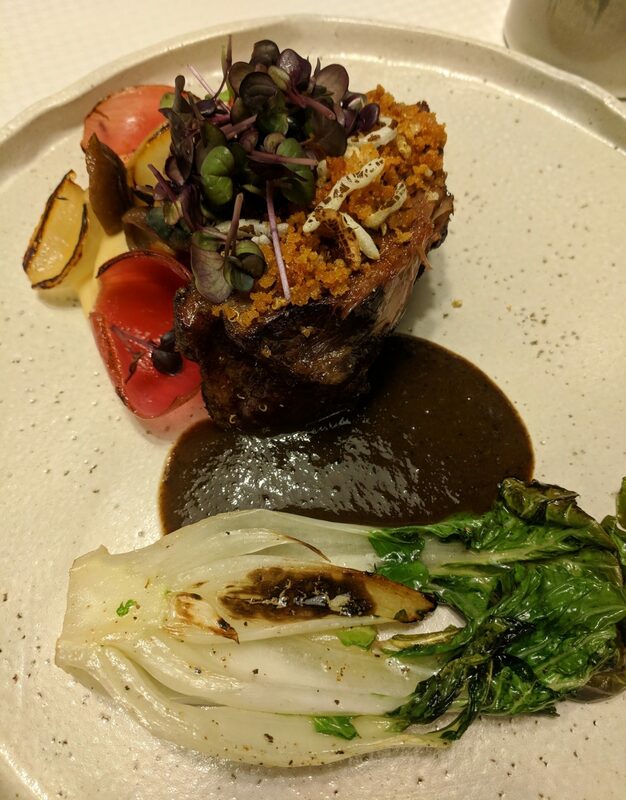 Other excellent restaurants were Maimuta and Casa Boema, both places at which I had a duck leg with red cabbage – I just couldn’t get enough of the stuff! Casa Boema in particular had a great atmosphere in the evening, offering outdoor dining amongst trees and fairy lights. But there was a clear winner for best restaurant in Cluj, and that was Baracca. The internet had told me that this was the best restaurant in the city, and as it was pretty much opposite our apartment we had to give it a try. It 100% lived up to expectations and the food was unreal. 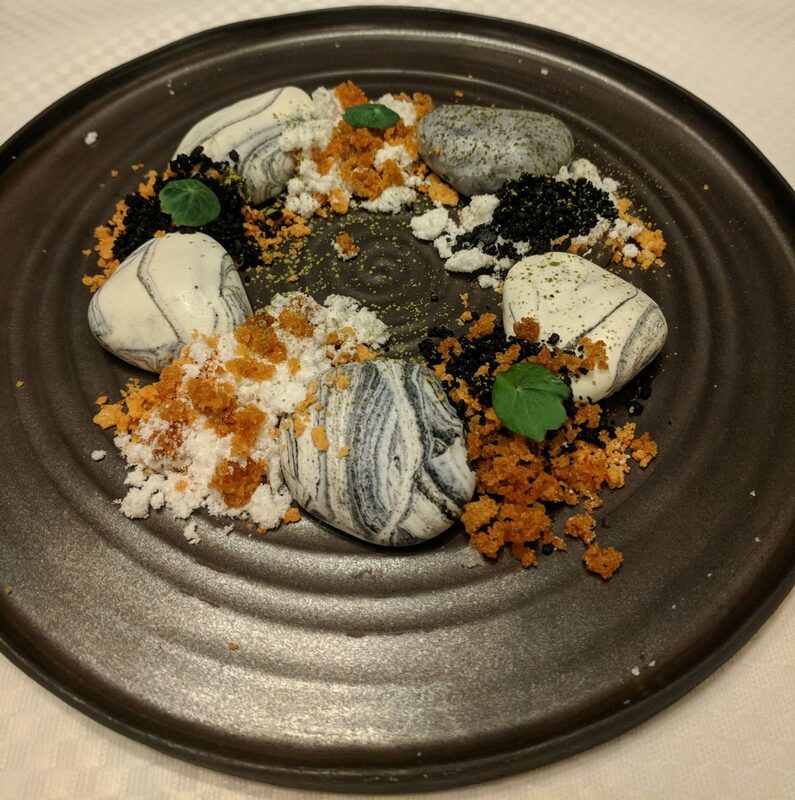 To start I had beef tartare with black garlic whilst Billy had a goats cheese mousse with lemon gel and butter powder (obviously I made him share it with me). The main course was the highlight of the meal and absolutely blew my mid. Billy and I both had Angus beef cheek with parsnip puree, homemade pickled onions, a foie gras infused gravy and a load of other stuff that I can’t remember. 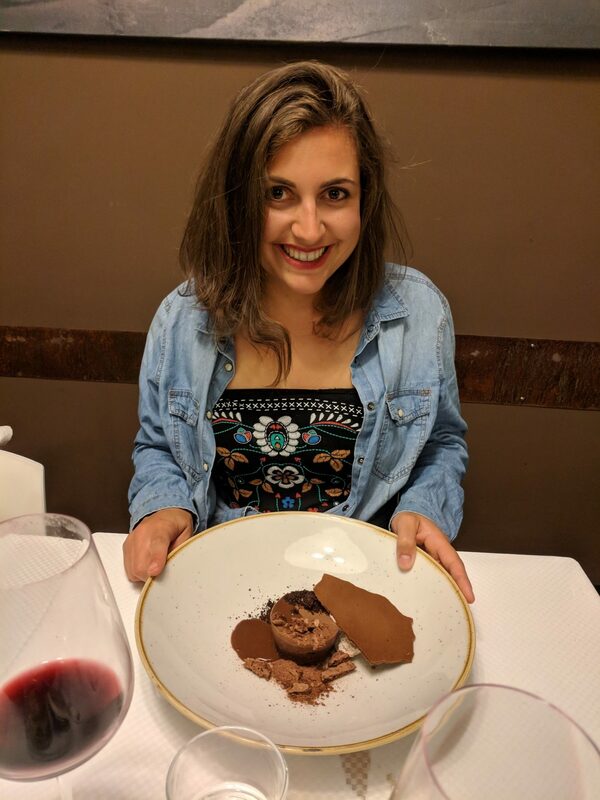 Then finally I experienced (which really is the right word to use here) the Chocolate Textures, which consisted of chocolate in a variety of different forms. Three courses each plus a bottle of wine came to around £75 for the both of us, which was incredible value for money. It’s AMAZING and I’ve been drinking it as often as possible since I’ve been home. I didn’t try a red, white or rosé that I didn’t enjoy but my favourites were Crama La Salina and Corcova if you’re looking for a recommendation! 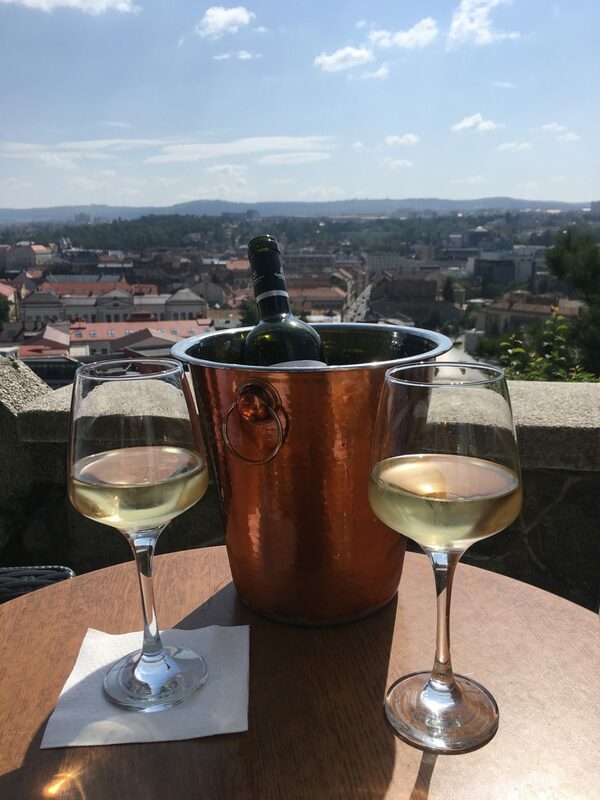 In terms of the best places to enjoy said wine, my favourite spots were Bricks (M)eating Point where you can enjoy a drink and some jazz over the river (the terrace literally juts out over the water), and Pergola Terrace on Cetatuia Hill which offers stunning views over the city… definitely worth the climb regardless of the wine! 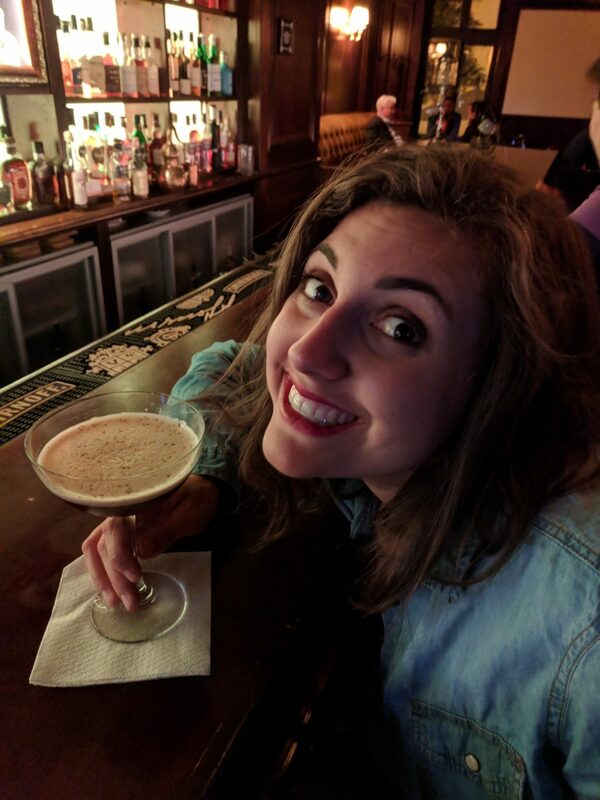 If you fancy a cocktail head to Charlie Bar where you’ll find a kickass Espresso Martini or Negroni for around £4. For beer try the Soviet or Enigma, the world’s first steam punk bar. 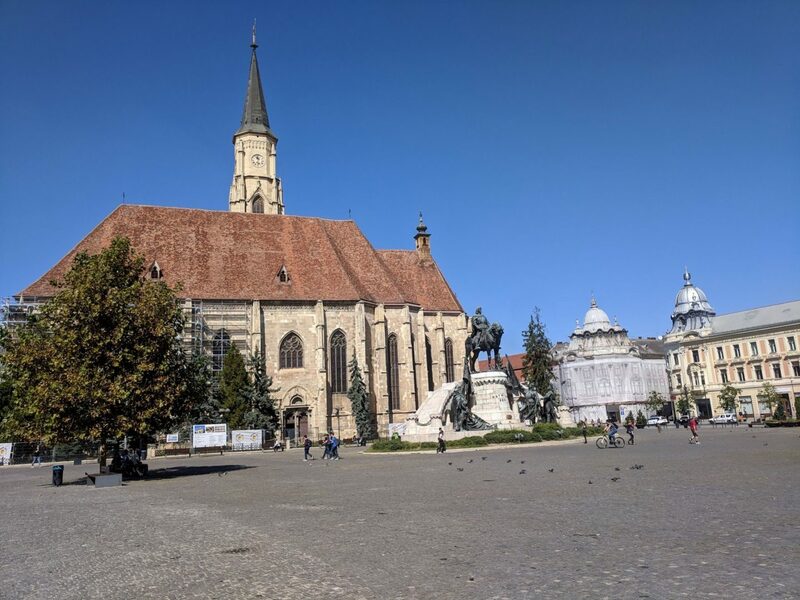 Cluj has a beautiful central square, which is dominated by the Matthias Corvinus statue and a majestic Gothic church. Cafés and restaurants surround the square and offer the perfect spot for people watching over a coffee. 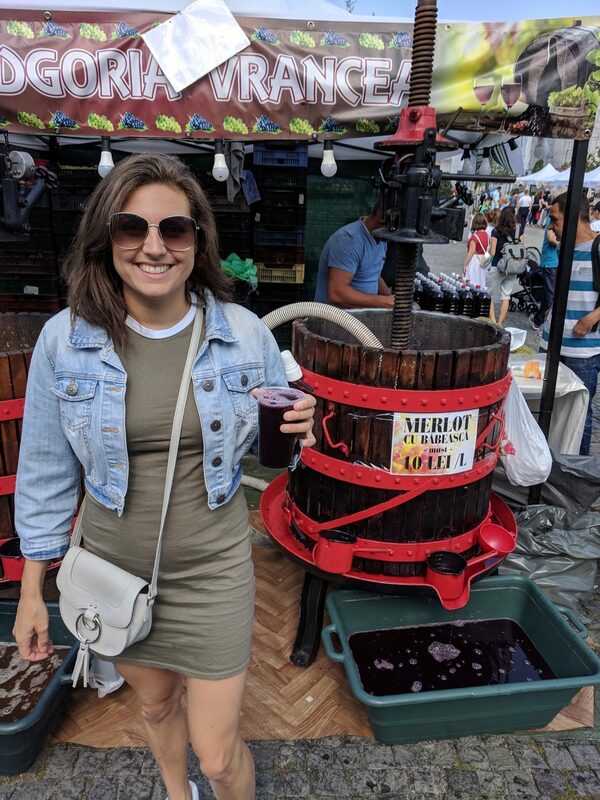 But the best bit about the square is the weekend market where you can treat yourself to bread, cakes, local honey, traditional clothes and freshly pressed wine/grape juice (we weren’t entirely sure if this was alcoholic or not) which tastes incredible. The square lead off onto cobbled streets, which offer plenty of restaurants, bars and shops… Perfect for getting lost on a sunny afternoon. 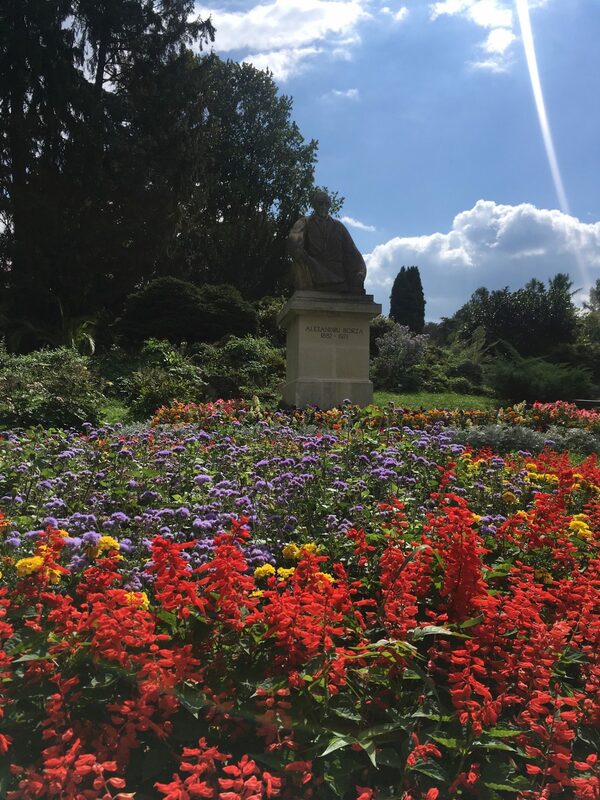 Just outside the city (we’re talking a 15/20 minute walk from the square) are the botanical gardens where you can explore 14 acres and 10,000 types of plants. 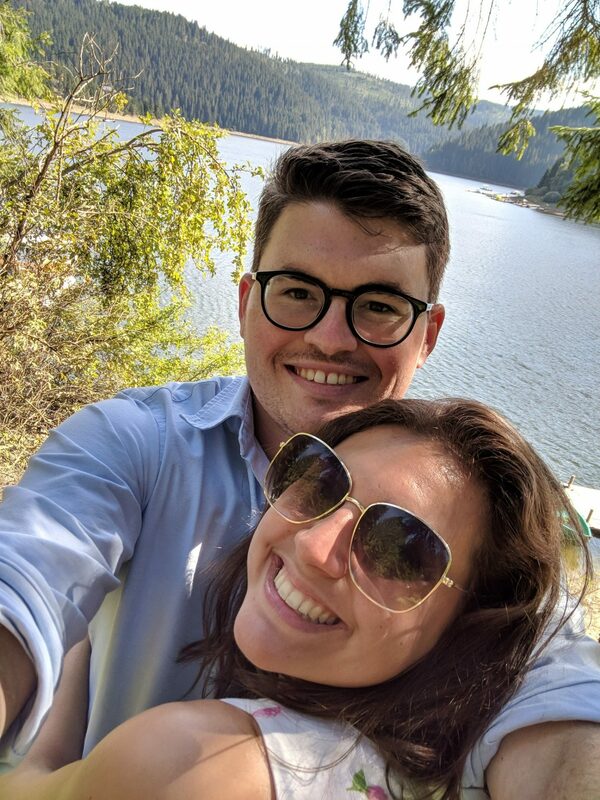 It’s great for walking off the hangover from all the Romania wine, and the Japanese garden is home to a lake full of the cutest little turtles! It’s about 40p for an adult, but the guy on the entrance charged us for student tickets (we look nothing like students) which were even cheaper. If you fancy a day in the park, this is the place for you. In the summer the trees are lined with hammocks full of locals reading or relaxing with friends, and the park plays host to an annual jazz festival (sadly we missed this). You can hire a pedal boat on the small lake, grab a bite to eat next to the water or just have a good old wander. This was a major highlight (after the food and wine of course). As we had a slightly longer holiday than we usually would for a city break, we hired a car for a couple of days and spent some time further afield. The salt mines are in Turda, which is about a 40 minute drive from the centre of Cluj. 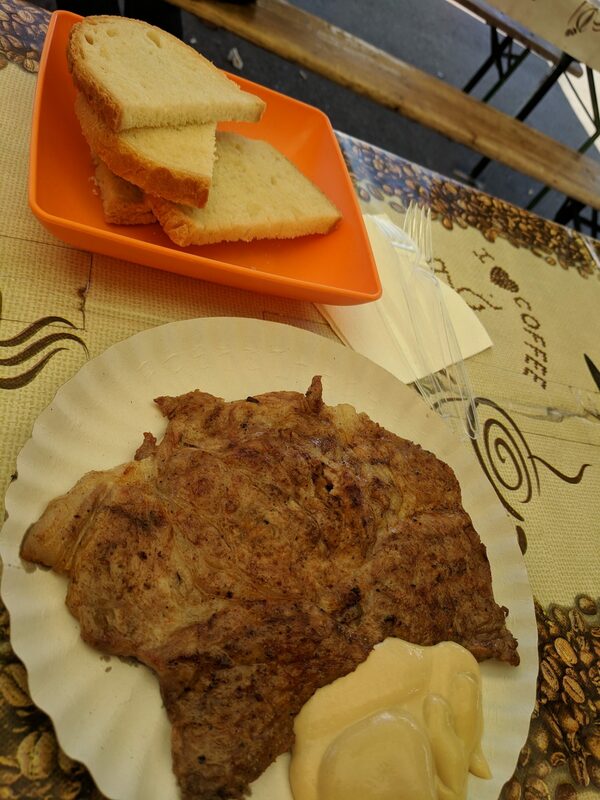 We stopped in Turda itself on the way for some lunch and a wander around the markets. It’s a lovely place so I’d highly recommend stopping off if you’re heading that way. If you don’t have a car, there are organised trips from Cluj that you can book on to, but obviously at a higher cost. The salt mines themselves were stunning, and so interesting! Take a jumper because it’s a little chilly in there, and spend some time learning about the salt mining trade in days gone by. 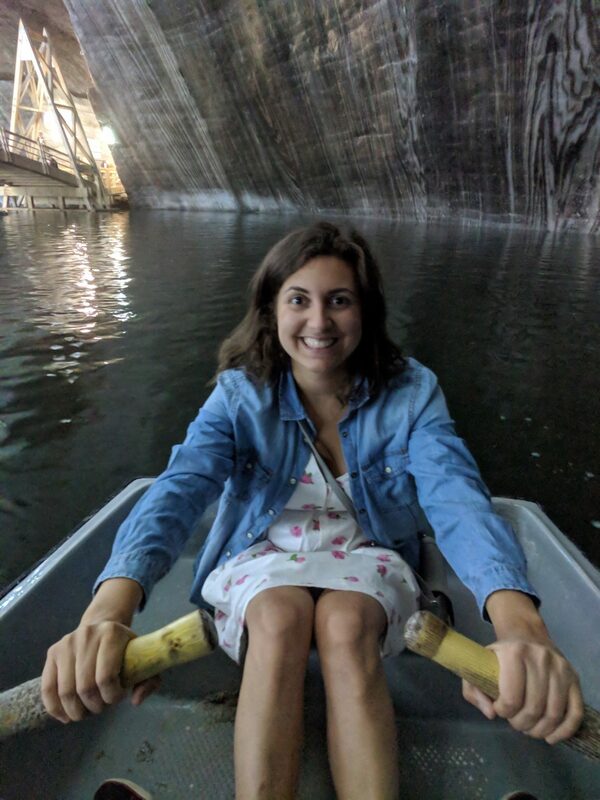 As you delve deeper in to the mines you’ll find the main attraction… a huge lake where you can hire a rowing boat! There’s also a ferris wheel, mini golf and bowling down there. 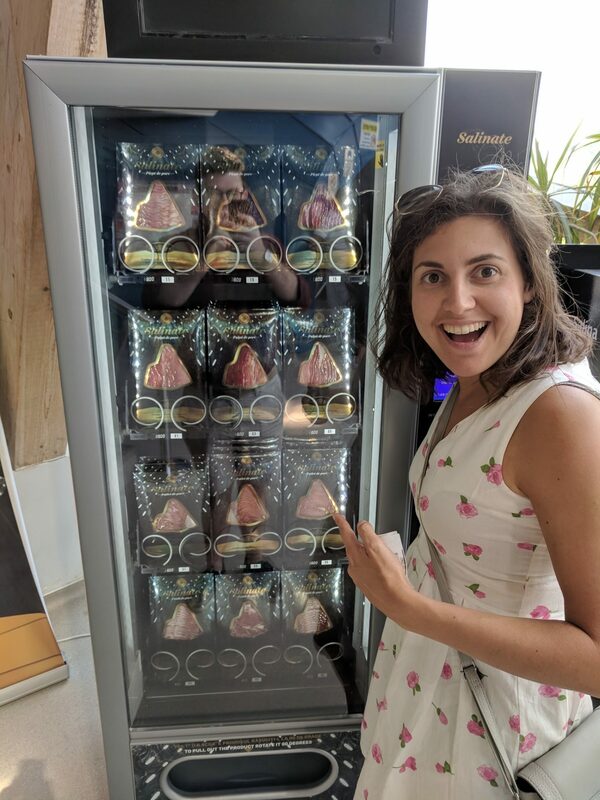 But the absolute highlight of the salt mines is… a ham vending machine!!! Never thought I’d see one of these in my lifetime. The ham in the vending machines is cured using salt from the mines, and obviously we bought some. It was really tasty! If you decide to hire a car, you need to drive through the Apuseni national park. We didn’t see much of it as it’s huge, but we drove through forests and around a stunning lake. If you like mountains and hiking it’s definitely worth visiting, and there are plenty of remote cabins that you can stay in. 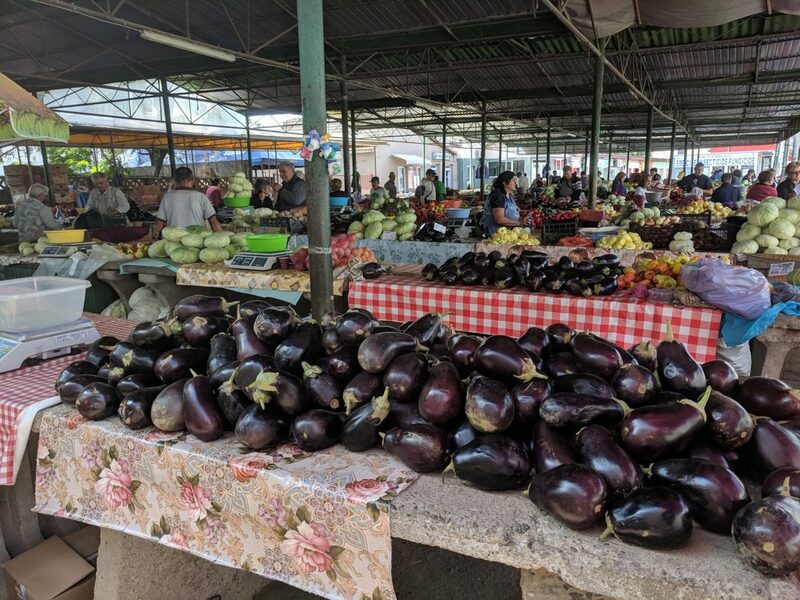 On the way to the national park, stop off at Huedin for endless market stalls including plenty of street food. We stopped at a couple of BBQ stands for kebabs and pork steaks, charged at pennies but so delicious! All I would say is DO NOT TRUST THE SAT NAV. We drove through some beautiful farm land with views of rolling hills and mountains. But we made the mistake of following the sat nav down narrower and narrower single track roads, feeling increasingly remote until we hit a muddy puddle and got stuck. With no chance of getting out of this pickle, we had no choice but to stand on top of the hill waving in all directions as it got colder and darker. Luckily a farmer spotted us in the distance and phoned his friend who came to our rescue. Through the miracle of Google Translate, we explained our situation and she kindly phoned another friend who turned up with his 4×4 and saved the day! 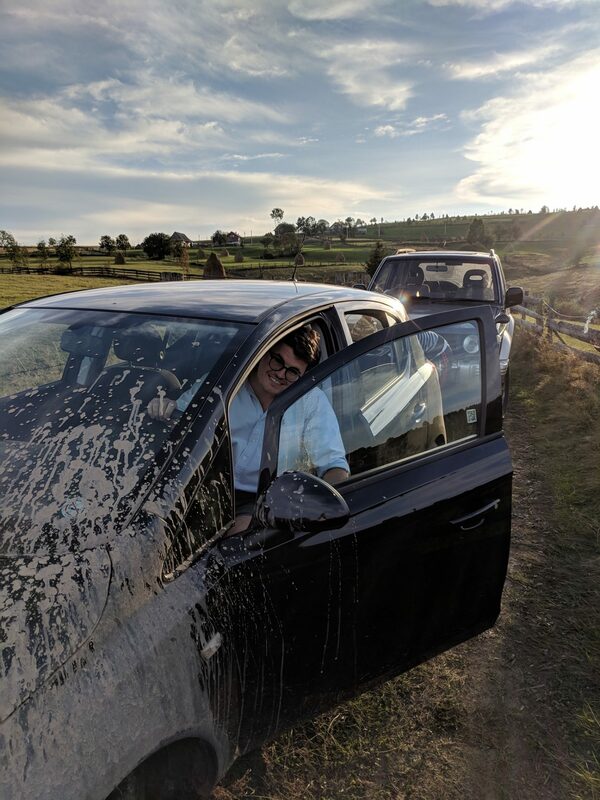 The woman even escorted us to her farm house where her son cleaned our car whilst we went inside for a much needed drink. There were loads of other things that we wanted to see but didn’t get the chance to, such as the Pharmacy Museum where you can make your own love potion, the Ethnographic museum where you can learn about the region’s history and the Hoia Baciu forest, a mysterious place dubbed the Bermuda Triangle of Transylvania. If you’ve been to Cluj and have any recommendations I would love to hear them, as it’s definitely somewhere I will be visiting again!